If you ever want to get six-pack abs, the first thing you must do is take a very close look at your current nutrition plan. As you have heard me say before, nutrition will result in 80+% of the results you see. If you eat like crap, more than likely you will look and feel that way too. Now carb cycling is a method that allows for rapid fat loss and fast results. Carb cycling is the same approach bodybuilders use to get ultra-low in body fat and is what models (the strong, lean kind) use when preparing for a shoot. You will burn lots of fat around your abs. You will maintain and add ripped, lean muscle. Results will come very quickly. Carb Cycling For Abs: Why it works? When you workout, your body uses a source of energy called glycogen which is stored in your muscles and liver. When you run out of glycogen, your body feels as though it just hit a wall (you know that feeling?). In order to replace these glycogen stores, you need carbohydrates. However, as you know, too many carbohydrates can lead to fat storage and large insulin spikes, which is NOT what we want. This is where carb cycling enters. See, a typical carb cycle calls for restricting carbs for a certain number of days, then upping the carbs for one day and repeating that process. When you restrict carbs for a certain period of time, you are forcing your body to use fat as its energy source. It typically takes a few days for your body to run dry on its glycogen supply (depending on how much you workout), so by properly timing your carbohydrates, you maximize your bodies ability to burn fat and add lean muscle. And note, if you start restricting carbs for too long, your body will start storing fat as back up energy instead of burning it. That is why it is important to have a “carb re-feed” every few days to ensure that your body continues to burn fat and not store it. That said, how often should you cycle in high carb and low carb days? Much of this depends on your goals, activity level, lifestyle, age, and current body composition. 3-2-2: Three low carb, two medium carb, and two high carb days per week. This is more geared to those that have a lower body fat percentage to start off with. Keep in mind, the more body fat you have, the less carbs you should eat in the beginning. However, carbs are essentially to everyone’s diet so be sure not to cut them out completely. Those are just three of the more popular approaches that I have seen lots of success with. The UltraCut Method 3-1 cycle is by far the easiest of the three, and the one I have seen the best results with. Depending on your starting point, goals, activity level, workout schedule, etc. will determine which cycle is right for you. It is important to take note that when first starting out, it is better to start on the lower end of carbohydrates instead of the higher end. The reason for this is because it is much easier to up the carb intake if needed rather than starting out eating too many carbs and adding unwanted fat in the beginning. So for starters, I highly recommend the 3-1 UltraCut Method approach. —-> Learn more about the UltraCut Method HERE! Carb cycling with the goal to get abs is one of the best decisions you will make. Essentially you are manipulating your bodies ability to burn fat faster and most times are directly targeting belly fat. 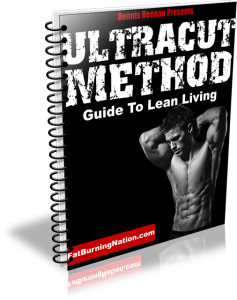 If you want to try out a very powerful and simple carb cycle approach, head over and check out the UltraCut Method. <——— See how one client lost 22 pounds of fat in 30 days and 8 pounds of fat in the first week! Discover how you can quickly and easily start burning fat around your abs while getting more healthy than ever before with the simple approach of carb cycling!